"Pilates started for me as a way for me to strengthen and tone my body after being a gymnast for many years. I didn’t feel like other forms of exercise targeted the same muscle groups that I wanted to maintain into my adult life. Over time, Pilates has become so much more for me. It’s about connecting my mind and body, incorporating breathing, and deepening my core strength. It is with Nikki’s guidance as an instructor that I realized these other components of Pilates. Nikki has helped me identify imbalances in strength and coordination, where I rely on one side of my body more than the other, and has designed our sessions to help correct these weaknesses. I’ve noticed a significant improvement in how my body supports me when running, hiking, kayaking, skiing, and enjoying the outdoors with my husband." "Nikki is an expert by training, experience and astute observation in anatomy and movement. Starting with an understanding of where I was, Nikki created a foundation to grow my body back to a balanced strength again. In addition to great Pilates exercises, Nikki also uses a memorable descriptive language that says with me throughout the day. Pilates works and Nikki is one of the very best trainers I have ever met!" "I started Pilates at Verve two years ago mainly because I had a bad back. My diagnosis was bulging discs in my low back. My pain was persistent and limiting my activities. I could no longer ride horses, golf, lift weights or really get much exercise. My Doctor had said I could try injections of steroids, or Physical Therapy. I tried Physical Therapy. I tried acupuncture. I was getting massages weekly...which was really the only thing that helped alleviate the pain. I was eating Advil like M&M's. I felt really old at 55 years of age. A friend recommended I try her chiropractor. I figured...why not? So I went to him and he started having me do Pilates exercises. Guess what? It helped! My back pain was slowly getting better. So I decided to start taking Pilates classes. Verve was the 2nd studio I tried and it was a good fit for me. Marie is caring and very kind. She is always concerned about how your body feels and works on ways to improve what ails you. The ladies at the studio are welcoming and really friendly. Today I am virtually back-pain free. I no longer take Advil four times a day. I'm now exercising at the gym two times a week and take Pilates classes two times a week. Pilates has freed me from chronic pain and I'm very grateful for that. Thanks Marie!" "Equestrian Pilates classes with Nikki has added much to my life. Being aware of every part of my body when riding is the most valuable tool I have, thanks to Pilates. Over five years of Pilates have enabled me to stay balanced and strong in my everyday life, and especially on my horse. I started at the beginning of the classes as a complete novice, and now I feel vastly more confident in my ability to ride and to be a perfect partner to my horse. Many times I have silently thanked Niki, when I had a close call! Strength and stability are only two of the gifts she has given me. Lots of hard work, but worth every second! Thanks Niki." "Sometimes simply the thought of having to be somewhere is enough to make you want to bail. Going to Pilates is no different, except that after that hour in class, the “happy endorphins” from working out and knowing that you’ve done something really great for your body and your entire self is enough to make you want to keep returning. It’s been too many years to count since taking an introductory Pilates for Equestrians class with Nikki LaFord and now it’s just a necessary part of life! The Pilates and core work is fabulous. Pilates for Equestrians taught by Nikki? Outstanding! Nikki is a born teacher and, even in a group, everyone feels as if it is a private session. She is attentive to each person’s “ailment du jour”, modifies exercises if necessary, yet encourages (okay, pushes!) us beyond what we think we can accomplish. Several class exercises complement those assigned by my physical therapist. The results for this almost-70-something student are gratifying: better balance, less chronic back pain, strengthened supporting muscles for a torn meniscus, and overall body-in-space awareness. Oh, and my horse is grateful too, for carrying a rider and not just a sack-of-potatoes passenger." "Around the time I turned 50, I had a major surgery. After recovering I realized I was badly out of shape. I couldn’t bend over and lift myself up without help. I had trouble putting on socks. My back was very weak and my muscles very tight. I heard about Verve Pilates from a radio interview and decided to try it. Almost 10 years later, I am almost obsessed with not missing a class. My back is so much stronger; I very rarely have to go to the chiropractor anymore and almost never have to take aspirin or other anti-inflammatory drugs to get to sleep because of back pain. I’ve become much more flexibility and energetic. Even when I think I’m too tired after work to go to class, I come away feeling more revived after we’re finished. Coming to Verve Pilates was one of the best decisions I’ve made and continue to make. Thank you Verve and Marie!" 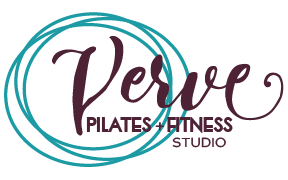 Verve Pilates and Fitness Studio. We are dedicated to your personal growth and balanced wellness. Live life Well. Live life in Balance. Live life with Verve. © 2017 Verve Pilates and Fitness Studio. All Rights Reserved.